With the economic downturn and the evolution of the business world in the last 10 years, has our ability to succeed on our own changed? 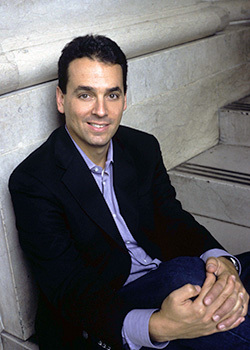 We continue our examination of the business book Free Agent Nation with an interview of author Daniel Pink. What was the impetus for you to write Free Agent Nation? The original article ran in Fast Company in what must’ve been late ’97–good God! The response to the article was pretty phenomenal. And I kept hearing from people, “I didn’t know I was part of this; I didn’t know I was one of these people; you put a name to it.” I also felt there was so much more to learn about this topic, so many more dimensions of it, so I started looking around. I decided to stick with the metaphor of free agent nation and go out and take a census. So for about a year, I went out around the country and interviewed people who had gone out to work for themselves–either had been pushed out of companies or leapt out of companies. I just tried to find out who they were, what made them tick, what the challenges were, what the joys were–just to try to draw a picture of this nation. Thank you for suggesting it did resonate with the business world! I think it’s because, first of all, it put a name to something that people sort of knew was going on, but was murky. I personally think that one of the reasons why is my identifying some of the forces behind this. So it wasn’t as if this phenomenon popped out of nowhere. If you look at the actual forces, it seems almost inevitable something like this would happen. And my talking about some of the consequences: the consequences to the social contract, the consequences to our notion of loyalty, the consequences to different kinds of organizations. I think it was a pretty rich topic and so people who were interested in it could find something meaningful to them. With the economic downturn and the evolution of the business world since the book came out, has people’s ability to succeed by themselves changed? I think the changes that have taken place are really interesting. The book came out in ’01 and so we are talking about a 10-year retrospective. But I think if you go back and look at some of the causes of this phenomenon, the causes have only intensified. One of them was the end of corporate paternalism, this idea that companies would take care of their employees the way parents took care of their children. It was clear that was ending around then, but in 2011, I don’t know if you will find anybody that would believe this idea that companies would take care of people. That notion of what a company does for people has profoundly changed. It’s kaput! It was evaporating back then, now I think it’s fully gone. The financial collapse has made people more cynical about trusting large institutions. The other thing I also wrote about is that today individuals have longer lifespans than organizations. All of us can expect to live longer than any organization that we would work for. That continues apace. Human longevity is increasing, corporate longevity is decreasing. And if you look at technology as a great enabler, it’s kind of quaint looking back at 2001: there wasn’t widespread broadband. There wasn’t YouTube. There wasn’t Twitter or Facebook. There weren’t many smartphones. It seems almost impoverished. One of the reasons why technology matters is it gives the individuals the kind of firepower that was once reserved for organizations. So that has intensified as well. Your books seem to be all connected by a focus on workers; what’s behind that decision? I have always been fascinated by work. One of the reason I was drawn to Fast Company was that in the very first issue, on the cover, was “Work Is Personal.” There were very few magazines, very few people out there, that were talking about work that way. If you think about work, it’s just this endlessly fascinating subject. We spend at least half of our waking hours working. So it becomes this incredible window into a whole variety of things: who we are human beings, how the economy works, how people relate to each other, how stuff is made, how the world spins on its axis. For me, it’s just an endlessly fascinating subject and all four of my books have revolved around work–not because there was some sort of master, strategic, authoritarian plan, but because that’s what I was interested in. How has your writing process changed from Free Agent Nation to writing Drive? One of the things is, in the writing process, if you do it enough you have a sense of where you are. I didn’t have that with the first book as I was writing it. Now as I write books, I have a sense of where I am. Unfortunately, the sense of where I am is usually behind. One thing is giving readers a different lens through which to understand their world. So part of it is conceptual. With a successful business book, people read the book, then they look at their work, they look at their organization, they look at the world, and they see it differently. The second thing is that they offer readers a few specific, actionable nuggets of advice on what to do as a result. If the new lens is right–or if it’s more right than wrong–what steps can I take to live my life or do my work or run my company better. Jim Collins does this exceptionally well, as do Chip Heath and Dan Heath. I would put Working on the list, Working by Studs Terkel. That book came out in 1974. Stud Terkel was an oral historian. He interviewed a bunch of people about their work–fire fighters, bartenders, police officers, people in the military, a baseball player, a prostitute, sales people–to ask, “What’s your work like?” I just think that’s a brilliant, meaningful book, even though it violates my two-part test from before. It doesn’t give you anything to do, but it does give you a different conceptual lens. I don’t think you can read that book without saying work isn’t personal, both its highs and its lows. I would put on that list Getting Things Done by David Allen, because that book gave you a neat conceptual lens. It helped you get stuff out of your head. It had all these incredible tips and tricks. At the very least, it was the reason I bought a labeler. And I hate to include this because it is so contemporary, but Moneyball. It is a good baseball book and a great business book. It’s important to challenge conventional wisdom and to challenge the orthodoxy. Most people don’t read business books and say, “This is my new Bible! I am going to carry out the edicts in this book religiously, for the rest of my life.” I think people read these books, they harvest the key ideas, and integrate them into their life. All the business books that I have read I have harvested things to inform my life. And that is what I tried to provide as a writer. Read more from Free Agent Nation and our Leadership Hall of Fame. 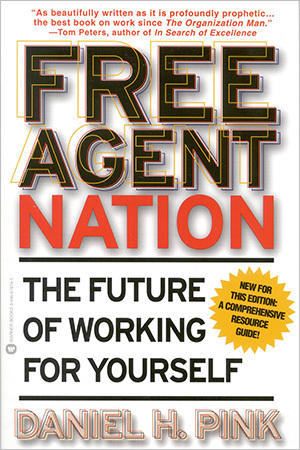 Daniel H. Pink is the author of FREE AGENT NATION: How America’s New Independent Workers Are Transforming the Way We Live by, published by Business Plus/Grand Central Publishing.